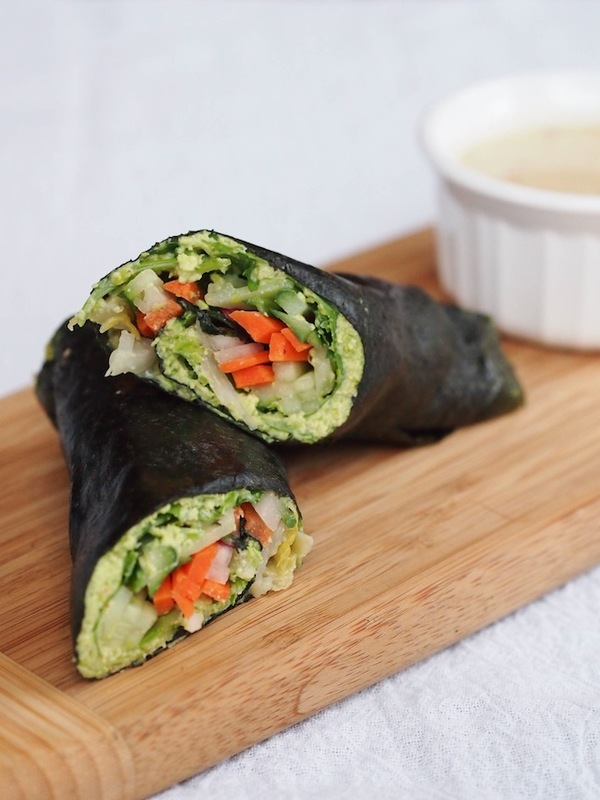 Edamame nori rolls with tahini dipping sauce are an easy and nutritious alternative to sushi. Perfect for lunch paired with a salad or as a snack! As we established in my very first recipe post (besides my lack of camera skills), I lack the hand-eye coordination to make homemade sushi. Early on in my cooking career, I decided I was going to become a sushi master so I could enjoy my favorite food on a regular basis. Then I actually attempted to make sushi. It's a lot harder than it looks! After creating a few overstuffed, buritto-like sushi rolls and watching an episode of Antony Bourdain in Japan where they showed the amount of training goes into making sushi, I decided to leave it to the experts. Until now, my one way of getting "homemade" sushi has been through my various renditions of sushi un-rolls, essentially a grain bowl topped with my favorite sushi fillings. But recently I discovered nori rolls, another way to faux sushi. 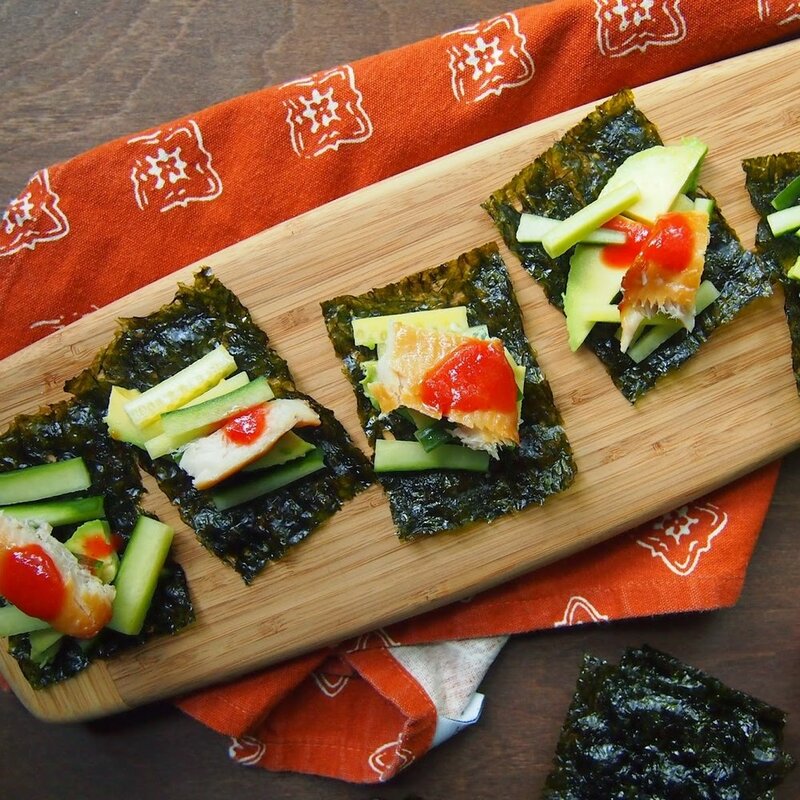 Nori rolls eliminate the difficult to perfect sushi rice and replaces it with a vegetable based spread. The spread holds everything hold together and makes it more nutritious by eliminating the white rice and sugary dressing. Despite being raw and vegan, this roll is super filling, with protein from the edamame and healthy fats in the dressing. We enjoyed a few rolls along with arugula drizzled with the extra dipping sauce and it lasted well into snack time, but you could also have a roll or two a snack. To save time, swap out the dressing for premade edamame hummus (I love the one by Eat Well Embrace Life) or guac. This is also an easy way to sneak in sea vegetables, a nutritious food we don't often eat outside of the occasional sushi roll. Sea vegetables, like nori, are a rich source of unique nutrients because it grows in the sea rather than on land. 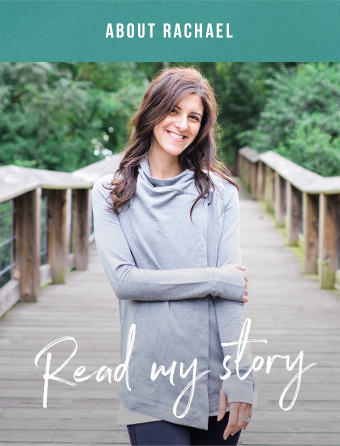 It's the best food source of iodine, a critical nutrient for thyroid health. Sea vegetables are also a rich source of sulfated polysaccharides, a starch compound with powerful anti-inflammatory benefits and an ability to help thin blood. To save time, swap premade edamame hummus for the homemade edamame spread. 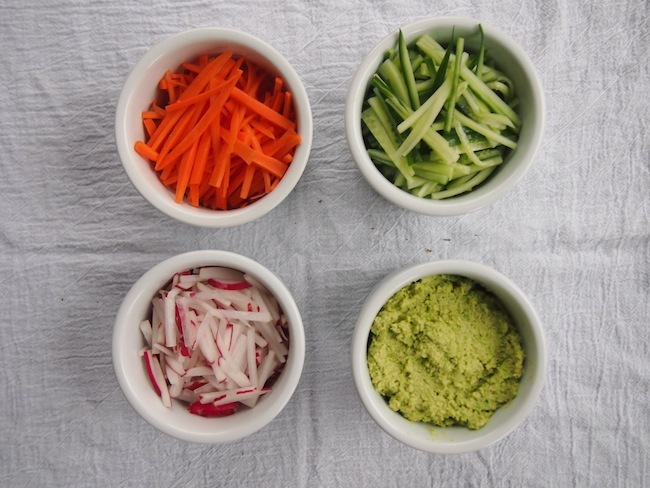 Place all the ingredients for the edamame spread together in a food processor. Blend until pureed, scraping down sides as needed. Set aside until ready to assemble. In a medium bowl, whisk together the ingredients for the tahini dipping sauce and season with salt as needed. Spread each nori roll with edamame spread, covering one side entirely with layer of edamame spread. Place radishes, carrot, cucumber, kimchi or kraut and a few small handfuls of arugula in a line on one side of the wrap. Roll up tightly, like sushi. Using a sharp knife, cut in half on the diagonal or into small sushi rolls.